Plot Summary: Takeshi Hongo and FBI agent Kazuya Taki fake their deaths when they are attacked by Shocker soldiers during a motocross race. They disguise themselves as Shocker soldiers and infiltrate the main headquarters, but it doesn't take too long for Eminent Chief Jigoku Taishi to find their whereabouts and trap them. 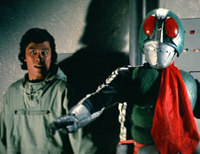 Before he detonates a bomb within the base, Jigoku Taishi tells Kamen Rider 1 and Taki that the Shocker Organization is preparing a giant laser capable of destroying cities. Our two heroes must escape from the base's self-destruction and stop Shocker from arming their latest weapon. Not only that, they must rescue Tachibana and the racing club, who have been abducted by Shocker's minions.